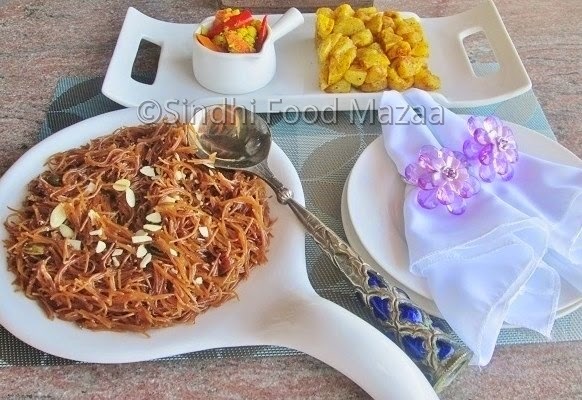 This is a typical Sindhi breakfast dish. 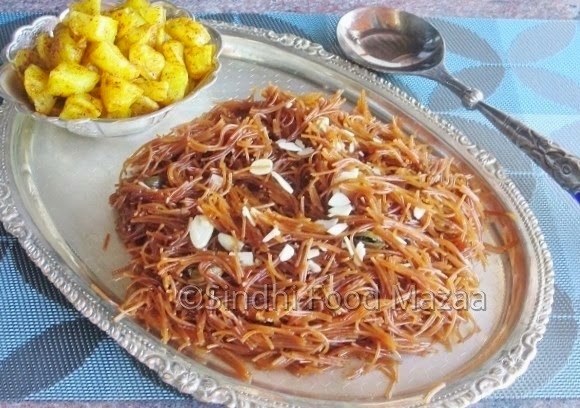 Sweet vermicelli with spicy fried potatoes. This dish always brings back childhood memories. When I made it for the first time, the vermicelli was not fried evenly. I was very unhappy about it, but my dad relished it saying that it was so good. 1. Heat ghee in a pan and put the crushed cardamoms. Add the vermicelli and stir fry it stirring continuously, taking care to get the even colour. 2. When the colour is brown add double the quantity (4 cups) hot water. If you are using the fine,thin vermicelli then reduce the water, 3 cups will be sufficient. Add a pinch of salt and saffron. Cover the pan and simmer to cook. 4. Garnish with crushed pistachios and almonds. Serve with fried masala potatoes. FRIED POTATOES :1. Cut the potatoes into cubes and put them in the salt water for 15-20 minutes. 2. Drain the water and deep fry the potatoes. Remove from the oil and sprinkle salt and all the dry spice powders immediately. Mix well. this looks perfect for snack or even light diner. I love this sweet semiyan dish. We make it on religious festivals.